Brigg Town Reserves slipped to defeat at home to Sleaford Town counterparts in the Lincolnshire League on Saturday. Ben Brown and Christopher Rodgers netted for Brigg, but they were no match for the visitors as Daniel McNamara hit a brace allied to strikes from Lee Llewellyn, Zac Wright and Sebastian Firman. 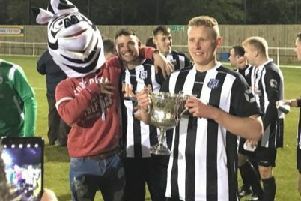 Elsewhere, champions Hykeham Town continued to set the pace as a Christopher Funnell hat-trick helped to secure three more points for last season’s treble winners at Skegness United. Callum Chapman and defender Ben Wyld also found the net for the champions, while Dominic Goddard netted United’s consolation. Cleethorpes Town Development Squad held seaside rivals Skegness Town to a 3-3 draw at Burgh Road. Louis Grant struck twice for Cleethorpes as they continued their unbeaten start to the season, and Matthew Milne was also on target for the visitors. McCauley Parker scored his second of the season for the Lilywhites, while Jordan Smith and Ben Davison opened their accounts to salvage a draw. Finally, there were six different scorers as Wyberton romped to a 7-0 win over Ruston Sports at The Causeway. Fraser Bayliss led the way with a double, while Michael Gardner, Ben Jaques, Elliott Pogson, Daniel Busch and Lee Orrey were also on target.